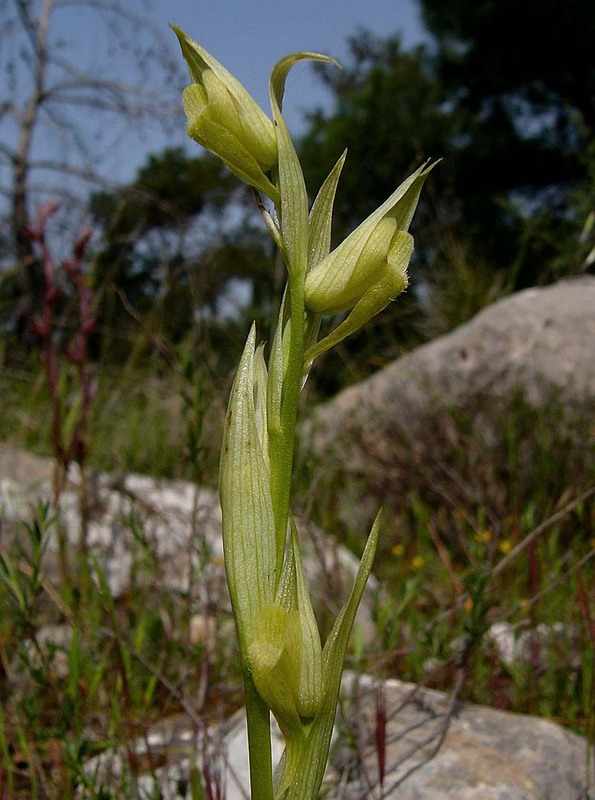 S. bergonii is on of the most frequently encountered Serapias in the eastern Mediterranean and its surprising therefore that the plant has only been known as a distinct species for just over a century, having first been described from Corfu in 1908 and named after the French botanist Monsieur P. Bergon. Much of its recorded existence has been spent as a sub-species to either S. cordigera or later S. vomeracea, in both cases as ssp laxiflora. There are a number of authorities who l believe this classification still to be correct and remain highly sceptical about its promotion to full species status. As with most of this genera, hybridization is common and over the years this has created large numbers of intermediate populations, though even where colonies seem free of any genetic interference, variation can be significant. S. bergonii along with its close cousin S. orientalis seem far more prone to hypochromy than others of their genera and this picture from Athens illustrates this propesity. S. bergonii is generally shorter than S. vomeracea and less robust but probably the key feature that distinguishes the two is the length of the bracts relative to the hood. In this species the height of the bract is no more than twice that of the hood whereas in S. vomeracea the relationship can be up to three times, this characteristic creating an impression of many church spires rising from a city skyline.